After eight years of suspension, settler-initiated evictions – with the direct backing of the state – are now advancing in full force in Sheikh Jarrah. With the displacement of the Shamasneh family in September 2017, settlers have reactivated the use of evictions as a primary displacement tool in this at-risk neighborhood outside the Old City, with the next targeted family scheduled to be evicted in the coming two weeks. The anticipated eviction of In’am Kneibi, a 77-year-old Palestinian woman from the Um Haroun section of Sheikh Jarrah, could coalesce with the opening of the US embassy in Jerusalem. Several days ago, the Jerusalem Execution Office notified Kneibi that she could be evicted any time between May 13 and May 27, 2018. The timing of the move has already set the city edge, as it comes directly on the heels of Jerusalem Day and the nationalist flag parade that marches through the Muslim Quarter of the Old City, followed by Nakba Day and the start of Ramadan Day, and in the context of the loss of Palestinian life during the weeks-long march of return along the Gaza border. The potential coupling of another eviction in Sheikh Jarrah – where approximately 75 families are currently at risk of eviction – and an embassy move representing the centerpiece of Israel’s 70 anniversary celebrations, could likely ignite simmering tensions in the city. The pending embassy move only serves to reinforce the deep political and socio-economic divide between West and East Jerusalem, as well as to fuel the Israeli government’s increasingly bold steps to consolidate control of the Old City and surrounding band of Palestinian neighborhoods, starting with last summer’s resumption of eviction proceedings and the government’s unfreezing of construction plans in Sheikh Jarrah. One long, dormant plan calls for construction of a seven-story yeshiva at the entrance to a neighborhood at the locus of a settler-organized campaign to exert sovereignty over the “Holy” or “Historic” Basin. The expected eviction of the Kneibi family represents an organized, systematic campaign by radical settlers, in cooperation with government agencies, to supplant Palestinian communities in East Jerusalem with new settlements. Dozens of families in and around the Old City are at risk of eviction, embroiled in exhausting legal proceedings in which settlers and government officials wield discriminatory laws to enable this accelerating trend. The suit against In’am Kneibi, filed by six Israelis whose family owned the cramped residence prior to 1948, symbolizes the inequities in Israeli and Palestinian property rights. According to the 1970 Legal and Administrative Matters Law, Jews can reclaim property in East Jerusalem lost before 1948, despite having received compensation from the state in 1948, while the Absentee Property Law of 1950 legally enshrines the prohibition against Palestinians’ reclamation of property lost during the same period. These undisguised steps to exert control over the most sensitive area of Jerusalem – now in tandem with plans to unilaterally redraw the boundaries of Jerusalem – preclude conditions for a return to negotiations and pose a fatal threat to the viability of the two state solution. Sheikh Jarrah – Um Haroun (west of Nablus Road): Approximately 45 Palestinian families under threat of eviction, at least nine families with eviction cases pending in the court system and an additional five who have received warning letters attached to eviction claims. Two families have already been displaced and their homes taken over by settlers. Sheikh Jarrah – Kerem Alja’oni (east of Nablus Road): About 30 Palestinian families under threat of eviction, at least 11 of whom have cases pending in court. Nine families have already been evicted and their homes taken over by settlers. Batan Al-Hawa (Silwan): About 100 Palestinian families under threat of eviction, 84 of whom have cases pending in court and 14 of whom have lost their homes to settlers. The legal basis for all of these claims is the Legal and Administrative Matters Law, enacted by the Knesset in 1970, which determined that Jews who lost property in East Jerusalem in the war of 1948, have the legal right to reclaim it from the Israeli General Custodian (responsible for managing unclaimed assets). Not only is there no parallel legal protection for Palestinians; the 1950 Absentee Property Law enshrines that Palestinians who lost their assets in Israel in 1948 cannot recover them. From this legal foundation, settler groups have acquired property rights from owners’ heirs and gained control over Jewish trusts established to manage properties prior to 1948. The General Custodian has both indirectly and overtly facilitated the acquisition of property and demands for the evictions of Palestinians from reclaimed properties. It is important to emphasize that most Palestinian families in question hold refugee status from 1948, have legally inhabited their homes since the Jordanian period, and in some cases continue to enjoy protected tenancy status. 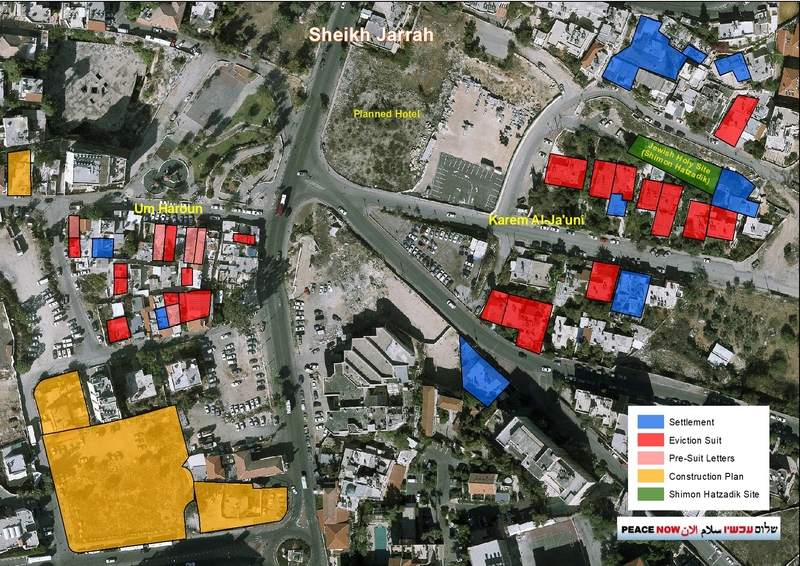 As clearly evidenced in this aerial overview of Sheikh Jarrah, the cases in question cannot be characterized as isolated disputes over land ownership between heirs and residents; rather, there is a systematic campaign being waged against the Palestinian population, with the end goal of forcibly transferring entire Palestinian communities. These evictions are being advanced by ideologically motivated, well-funded settler groups such as Ateret Cohanim, which operates in the Old City and Batan al-Hawa, and Nahalat Shimon in Sheikh Jarrah. Despite having no verifiable connection to original landowners, these groups have the resources to locate property owners’ heirs and acquire their rights in order to advance their ideological agenda. Representative of flagrant cooperation between the General Custodian and settler organizations, in some of the eviction cases in Um Haroun (Sheikh Jarrah) – including the Shamasneh family case – the General Custodian has been represented by an attorney who frequently serves on behalf of settlers in East Jerusalem and the Occupied Territories. In Batan Al-Hawa, the General Custodian issued a certificate of release to settlers who managed to assume administration of a local trust in 2001. In one case ensuing from this transfer, the General Custodian went so far as to determine the boundaries of a parcel of land targeted by the settlers according to information they provided. In 2017, Hananel Gurfinkel, a settler living in the Palestinian neighborhood of Jabel Mukaber who has established an association for the purpose of developing settlements in Palestinian neighborhoods in East Jerusalem, was appointed by the Ministry of Justice to manage assets in East Jerusalem under the purview of the General Custodian. Since Gurfinkel assumed his position, Palestinian residents have witnessed a demonstrable change in management, especially in the Um Haroun neighborhood: there has been a sharp uptick in letters threatening eviction and multiple lawsuits have been filed by the Custodian against Palestinian tenants. Over the years, settlers have succeeded in acquiring control of trusts established to manage Jewish assets predating the war in 1948. On the basis of this authority, they have been able to take over numerous properties in the Old City and surrounding Palestinian neighborhoods. In Batan Al-Hawa, settlers are submitting claims against Palestinian residents under the auspices of the Benvenisti Trust, established at the end of the 19th century to provide residential assistance to indigent Yemenite Jews. More than a hundred years after the trust was established and disbanded, Ateret Cohanim appealed to the District Court to administer the trust, ultimately winning control despite no certifiable connection to the original owners. Reversing a security policy providing that the Police would not assist in the evacuation of Palestinian families, the Israel Police now cooperates closely with settlers. In October 2015, during a period of extreme violence in Jerusalem, the Police imposed a curfew on the entire neighborhood of Batan Al-Hawa in order to assist in the eviction of the Abu Nab family. A Haaretz inquiry revealed that the Police went so far as to provide private protection for settlers who confronted Palestinians to pressure them to leave their homes.